A game that Dale could have won but was cruelly taken away from them four minutes from the end. Chester played well in the first half and Dale clung on to only be trailing 21-8 at half time. Wharfedale dominated the second half for 36 minutes and could have had a winning, bonus point try but for a mistake by the referee, who was honest and brave enough, to admit that Phil Woodhead’s second try should have been allowed but he had given Dale a scrum in Chester’s 22. This was a magnificent second half performance by the Green Machine. They outplayed Chester in all areas of the game for 36 minutes and would have deserved the 5-point victory. Dale opened the scoring with a penalty from Jack Blakeney-Edwards. This was a strong start from the visitors led by Matty Houghton who charged at the Chester midfield and had them giving away the penalty. Chester then asserted themselves and a break by Matt Van Sertima led to Sean Green scoring wide to the right. 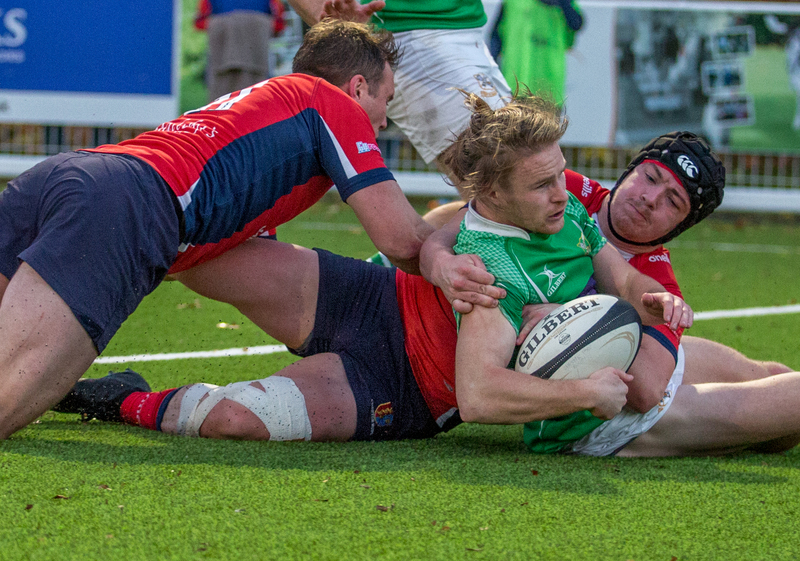 James Robins landed the conversion. Wharfedale did have possession in the next 15 minutes but could not get any meaningful field position. Chester hacked a loose ball into Dale’s 22 and good follow was rewarded with a penalty. The kick to the corner was followed by an effective catch and drive with Joshua Woods touching down. Robins again had no problem with the kick and Chester led 14-3. Dale hit back just after the restart. James Tyson charged down a clearing kick and Rhys Lovegrove picked up the loose ball to score. Blakeney-Edwards saw his conversion hit the upright. The home side then dominated proceedings but the Dale defence held. Chester did have chances but on a couple of occasions ignored overlaps and were then swallowed up by the defence. One or two mistakes crept in which did not help Dale. Most significantly was a line out on a rare visit into Chester’s 22. A chance to attack the line and actually go into half time with a lead. The line out was lost and Chester cleared their lines and went on to get field position in Dales 22. The other significant blip was then. A dominant Wharfedale scrum was penalized before Phil Woodhead put the ball in and then a missed tackle gave Chester room for Shay Owen to score a converted try. Chester were probably worthy of the 21-8 lead but Dale showed great determination and were still in touch. Wharfedale opened the second half with a powerful display of controlled rugby. Runs by Phil Woodhead and Reece Ward forced a penalty in Chester’s 22. The kick to the corner was followed by a well-executed catch and drive with Dan Stockdale being awarded the try. Blakeney-Edwards converted to leave the score 21-15. Dale continued to dominate and were playing breathtaking rugby. Nothing complicated but hard tackling, good running and simple off-loads and passes. A high tackle by Chester’s number 8, David Ford, saw the veteran take a 10 minute rest and Chester’s scrum further depleted. Dale pressed home the advantage and put the home scrum under intense pressure. The dominance was rewarded when Woodhead darted over for a try and the conversion saw Dale nudge into the lead. Wharfedale continued to dominate and if Woodhead’s second try had been allowed would have established a two-score lead. Instead their only reward was a Blakeney-Edwards penalty that established a 4-point cushion. However, it was not to be. Chester regathered the restart and 10 phases later were awarded a try by Ford which James Robins converted. There were so many positives to take back to the Avenue from this game. Chester had much the better of the first half but Wharfedale battled hard and stopped them from establishing a bigger lead. The first 36 minutes of the second half was some of the best rugby from the men in green for a long time. All players contributed to an outstanding performance. This was a great game of rugby with both sides entertaining the crowd on a pleasant afternoon. This was another occasion when it would be wrong to pick out an individual. The whole team played to such a high standard. Chester awarded a pint to Matty Houghton as our outstanding player. Matty did not let the team down and downed his pint ahead of the two Chester payers. Rhys Ward deserves a mention for the speed he got up to when carrying the ball. Somebody suggested that he had seen a pie ahead of him. The pack was strong and as one supporter said about the Chester eight – “They are coming out through the sunroof” at the scrum. “The moment” lingered long in everybody’s mind after the game but I will mention the conduct of players, coaching staff and support. There was no vilifying or harassment of the referee. He was treated with respect and his sincere apology accepted. I, amongst others, found it heartening that an official could be honest and admit the error and sit down with players after the game. This incident should not however detract from what was a splendid game of rugby and the high standard of rugby that Wharfedale (and Chester) played.